A friend of mine lives on a very busy corner. She needed landscaping done and called a new company that had left a flyer on her door. They offered organic landscaping services. She offered to let them put a sign in her yard in exchange for free service. They agreed and did her yard. Now they are getting more business than ever as a result of being able to use her yard as an example. This works especially well for companies that are first starting out and need referrals. Drive by houses that are having construction or renovation done. I have found perfectly good rose bushes on the curb because the owner didn't want to care for plants that needed a lot of maintenance. When I go to yard sales, I frequently see unusual plants in seller's yards. I will admire the plant and ask where they bought it, or ask if I can buy a root cutting, etc. Most people are so flattered at the compliment that they will give me the cutting rather than charge anything. I always remember to carry a plastic bag and a few gardening tools in the car, so I don't have to inconvenience them while they are tending their yard sale. Nurseries will sell dying or broken plants at a discount (or when they are getting in new stock). Ask them to give you a deal on quantity or anything that is likely to be thrown out. Don't forget to check with them at the end of the season when the planting season is over. You can find the best deals then. A great way to make a path is to use newspaper and mulch. I saved all of our newspapers for a couple of months and called the local tree trimming company to deliver wood chips. They love to get rid of the chips. I made a path with the newspapers and then I spread the mulch. The paper helps to prevent weeds. The next year, I began buying stones to place in the middle of the mulch to make it look even better and also easier to walk on. I bought two stones per week. Now, it looks like a foot path on a hiking trail. For cheap landscaping, get to know someone in your area who has a beautifully landscaped yard and ask a lot of questions. Most people with mature gardens have tons of plants to give away free for the digging. My friend is starting up a cottage garden and I gave her about 25 plants that I dug up from my garden and I have more she can dig up when she is ready. She is saving a least $100 in plants. A mature garden needs to be thinned out sometimes. For a cheap pathway, you can use plain cement pavers with a ground cover grown in between. I made a patio area with two different colors in a checkerboard pattern and put "snow in summer" in between. I also saw a beautiful path in a book made up of broken up driveway cement. They laid it down like flagstone and had the same effect without the expense. As far as ground cover, it will make a difference where you live, what kind of sun you get and what kind of moisture. That's where a knowledgeable neighbor will come in handy. Also, visit a local nursery and ask a lot of questions. They can let you know what works and what doesn't work. Otherwise, you can kill a lot of plants putting them in the wrong place. For the best look with plants, plant multiples of the same plant together to get a mass of one color. When you move into a new home, hold a simple housewarming party with a garden theme. On the invitation say, "No gifts please, but we'd love to have your garden cuttings or transplants!" People won't feel obligated, but instead, they will feel good about being able to share their horticultural wealth. (Plus, it gives them the needed "push" to divide the plants they'd been meaning to anyway!) When I moved into my house as a single mom, I received hostas, a climbing mandevilla and some daylilies this way! What a wonderful opportunity you have to create a beautiful landscape. First of all, I would suggest visiting your local library to learn about landscaping design, including different types of materials and plants that would work well in your area. Also, join your local "freecycling" group and let them know you're looking for landscaping materials and plants. I have had wonderful experiences with my local freecycle(tm) group and have even joined a local plant-trading group! As a gardener, I think that we are by nature generous sorts who love to share our plants! Good luck and remember to enjoy this creative process! Check out the landscaping and gardens of friends and family. 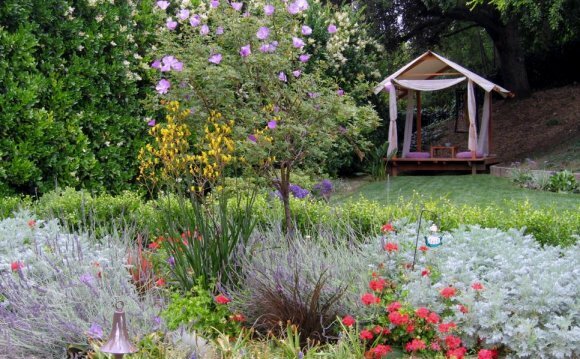 This will give you some good ideas of things that could be easily replicated in your own yard. While they are showing you their yards and gardens, ask them if you could have some starts off of their plants. Most people are only too willing to help you out with starts of plants. Buy your gravel or landscaping stones from a quarry instead of a department store. Check with the city or county you live in to see if they have a free mulch or compost site. Many towns have these and are glad to get rid of it. Lay old newspapers on the ground, several layers thick, for weed block. Make sure that you cover the newspapers right away with mulch or landscaping rock, so they don't blow away. Check out garage sales. Several times, I have found gardening tools, landscaping edging, plants, etc. for pennies on the dollar of what it would cost to buy at the store. Check with your local cement company. Many times people order too much cement for a job and then the company has to get rid of the excess somewhere. In our area, if you take in the forms you want poured for stepping stones, the cement company will pour these for free and when they have dried you can go back and pick them up. One of the best resources for inexpensive landscaping ideas is a local garden club or horticulture society. Often they have perennial sales with great prices, and they can offer a wealth of ideas. I have also contacted a local vocational school for assistance. Many times the students are more than eager to help out and share their knowledge. We are fortunate in our area to have an excellent nature program associated with our public schools (beginning in kindergarten), and the knowledge base is priceless! Start by choosing areas you want to keep as garden beds. Remove any weeds by tilling/pulling and cover with a healthy bed of mulch. Four to five inches thick will keep weeds at a minimum. You can obtain tons of free mulch at the local compost site. Call the city for details. For stepping stones, or a mosaic walkway, contact a concrete contractor and tell them you are interested in the broken remains of concrete sidewalks or driveways they remove. They will be happy to let you take some, as they have to pay for the removal. Arrange the concrete pieces as you like and dig them in, smooth side up, flush with the ground. Then buy a gallon of concrete stain from a home remodel center and stain the part of concrete that is showing. For a more natural look, get two similar terracotta colors and brush randomly on each stone.